With the exception of the Cello Sonata, which was written in 1901 following his Second Suite for two pianos and Second Piano Concerto, all of Rachmaninov's chamber music comes from the earliest part of his career. This body of work comprises the four compositions on this disc, together with two unfinished string quartets and also two Romances. The early completed chamber works of Rachmaninov make a fascinating group. They were composed in the two years up to December 1893. All of this music, therefore, was written before the composer was twenty-one, yet it is wholly characteristic and by no means immature. 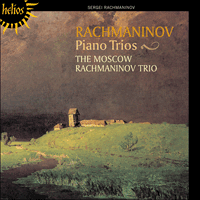 The Moscow Rachmaninov Trio show great insight into the composer and their performances bring depth to the works. This recording includes Trio Elégiaque No 2 which Rachmaninov started to write on the evening of Tchaikovsky's death on 25 October 1893 and completed on 15 December. Rachmaninov was deeply shocked and distressed at the news of Tchaikovsky's death and the piece was written to the memory of him. With the exception of the Cello Sonata in G minor, which was written in 1901 following his Second Suite for two pianos and Second Piano Concerto, all of Rachmaninov’s chamber music comes from the earliest part of his career. This body of work comprises the four compositions on this disc, together with two unfinished string quartets, both having just two movements extant from doubtless planned four-movement structures. There are two Romances, one for violin and piano, the other for cello and piano, which were published posthumously and which date from about the same time (that for cello is dated 6 August 1890). It is a pity that Rachmaninov did not complete either (or both) of the string quartets, and that he did not compose a major chamber work later in life. Had his friendship with Fritz Kreisler in the 1920s produced a violin sonata, for example, we might well have had an additional masterpiece from him. However, the early completed chamber works of Rachmaninov make a fascinating group. They were composed in the two years up to December 1893. All of this music, therefore, was written before the composer was twenty-one, yet it is wholly characteristic and by no means immature—for by this time he had also written a one-act opera, Aleko, the Fantaisie-tableaux (First Suite) for two pianos, and the first version of the F sharp minor Piano Concerto, his Op 1, together with other pieces, most notably the Prélude in C sharp minor. The score of the Piano Concerto is dated 6 July (in the old Slavonic calendar) 1891; once it was completed, at the family estate at Ivanovka, the following few weeks saw the comp­letion of a song, Morning (which formed one of a group of six songs published as Op 4), and a Prélude in F major for solo piano, completed on 20 July. It was probably around this time that Rachmaninov met the well-known Russian cellist Anatoly Brandukov, almost seventeen years his senior and the dedicatee of Tchaikovsky’s Pezzo capriccioso for cello and orchestra. Musically, at least, Brandukov and Rachmaninov appear to have been kindred spirits, for the cellist became the dedicatee of Rachmaninov’s two published works for cello and piano—the Two Pieces Op 2, and the Cello Sonata Op 19—and took part in the first performances of all of Rachmaninov’s chamber works with cello. Rachmaninov’s Op 2 Pieces for cello and piano, which were among the first of his works to be published by Gutheil, comprise a new version of the F major piano Prélude mentioned above, and a Danse orientale. The Prélude retains F major as its key and begins at once with the cello’s statement of the main theme, accompanied chordally by the piano. A restate­ment, slightly more elaborate, follows, leading to a faster section in which the piano assumes greater importance, although both instruments are fully utilized. A strongly varied recapitulation of the opening theme, with the piano more assertive—though still accompanimental—brings the Prélude to a quiet ending. The succeeding Danse orientale, in A minor, is more fluidly constructed, with a characteristic opening theme that is sub­jected to a variable state of flux in its working, but always returning to A minor. The quiet pizzicato ending is another characteristic touch. By the time of the two ‘Morceaux de salon’ Op 6 for violin and piano—that is to say the summer of 1893—Rachmaninov was more securely established as a composer and pianist. His Op 3 piano pieces (including the C sharp minor Prélude), along with the Op 4 songs, had either appeared, or were about to appear, in print, and he had completed the Fantaisie-tableaux for two pianos. The Op 6 pieces—a Romance and Danse hongroise—are similar in scope and plan to the cello pieces, Op 2. It is probable that they were dedicated to the violinist and composer Julius Conus as one source claims, but no details are extant for the first performance. The Op 6 pieces share the same key, D minor, and the relatively extended Romance opens at once with the main theme on the violin, heard against a flowing accompaniment. A developmental counter-statement of this theme has the violin mostly in octaves, while the piano writing is also fuller and more dramatic. This leads to a relatively straightforward recapitulation before a brief but effective cadenza for the violin heralds the concluding four bars, rooted to D minor. The Danse hongroise, marked ‘Vivace’, is a brilliant piece, very typical of Rachmaninov (especially in the accompanimental keyboard figure), which at one point seems to echo an idea from the main theme of the Romance. Such is the composer’s mastery of violin writing (though he may well have enlisted Conus’s assistance in this regard) that one regrets that he did not leave a more extended work for the instrument. On 30 September 1893 Rachmaninov’s piano teacher, Nikolai Zverev, died aged sixty-one. Many musicians, including Tchaikovsky, attended the funeral, and it was on this occasion that Rachmaninov renewed acquaintance with the famous composer. A day or so later, at Taneyev’s home, Rachmaninov showed Tchaikovsky the score of his Fantaisie-tableaux, and obtained permission to dedicate the work to him. Tchaikovsky had been an important ally in getting Aleko performed at the Bolshoi, and the work’s success on that occasion led to Rach­maninov being invited to conduct a new production in Kiev, in October. Consequently, Rachmaninov missed hearing Tchai­kovsky conduct the premiere of his new Pathétique Symphony in St Petersburg on 16 October. Rachmaninov (making his debut as an opera conductor) directed the first two performances of Aleko, and returned to Moscow to prepare for the imminent first performance of the Fantaisie-tableaux in November. It was fortuitous in one regard that Rachmaninov was unable to travel to St Petersburg, for a cholera epidemic had broken out there. Although there is some doubt as to the exact nature of his final illness, it has long been thought that Tchaikovsky had, incom­prehensibly, drunk some unboiled water during the outbreak and contracted the disease. He died suddenly on 25 October. Like the rest of the musical world, Rachmaninov was deeply shocked and distressed at this news. On the evening of Tchaikovsky’s death he began a second Trio élégiaque to the memory of the master, completing it on 15 December. It is difficult to remain unimpressed by this work. It is true that the piano part is florid and very difficult (at one point, towards the end of the first movement, it erupts into a quasi-cadenza), and is clearly far more important than those of the stringed instruments. The finale is possibly too short to balance the large dimensions of the first two movements—but what passion and genuine depth of feeling are contained within this work! Rachmaninov’s Op 9, dedicated ‘To the memory of a great artist’, is as worthy a memorial to Tchaikovsky as Tchaikovsky’s A minor Piano Trio Op 50 was to Nikolai Rubin­stein in 1881. The connections between these memorial trios run deeper; structurally, Rachmaninov’s work is strongly based on Tchaikovsky’s—to the extent of having a set of variations as the second movement, and the thematic likeness of both variation themes implies that Rachmaninov based his on Tchaikovsky’s. The first movement of Rachmaninov’s D minor Trio élégiaque would seem, structurally, to be modelled to some degree on his earlier G minor work, but with a greater level of accomplishment. Thus a broad outline of sonata structure can be discerned, but here the material is even more homo­geneous, and the manner by which the introductory lament is restated and expanded, leading to a wealth of material which appears to be a succession of closely inter-related variations, and the strict manner in which this is recapitulated—along­side the subtle tonal relationships of the movement—show this music to be Rachmaninov’s greatest large-scale achieve­ment up to then. As noted earlier, variation form is the basis of the second movement, and here the piano assumes possibly greater importance than in the first movement. The piano alone announces the long theme on which the ‘quasi variations’ are based, and the piano also has a long solo variation (the second). However, the eight variations (not so numbered by the composer) are both extensive and quite wide-ranging, although the string writing is such as to place these instruments very much in the musical background. The finale is quite short and structurally simple. Once again the piano predominates, and begins with a strongly Tchaikovskian idea which dominates the first half of the movement. This builds to a climax, after which the opening lament of the first movement is alluded to before finally re­appearing in full, its chromatically descending phrase bringing the Trio élégiaque full circle. The end of the work is restrained to cello and piano. The violin is absent. In the original version of the Trio, Rachmaninov called for a harmonium in the second movement. Such is the writing for this instrument that it is virtually impossible for the pianist to play the harmonium as well as the piano. Thus this original version must be the only instance in a piano trio when four instruments, and four players, are required! In 1907 Rach­maninov published a revised edition in which the harmonium is dispensed with and other changes are made, the most important being a new variation in the second movement to replace another discarded solo piano variation. For another performance in 1917, Rachmaninov made several other important changes—principally in cutting quite a few bars to tighten the structure. The original version of the Trio élégiaque was first per­formed in Moscow on 31 January 1894, in an all-Rachmaninov programme given by the composer with Brandukov and Julius Conus. This also included the Op 2 pieces for cello and piano, the Op 6 pieces (which may have been their public première), and Rachmaninov playing his Op 3 complete and his new Op 10 Morceaux de salon, together with some songs (presumably from Opp 4 and 8). The torch had been passed to a younger generation. Hormis la Sonate pour violoncelle en sol mineur, écrite en 1901 (après la Suite no 2 pour deux pianos et le Concerto pour piano no 2), Rachmaninov composa sa musique de chambre au tout début de sa carrière, comme l’attestent les quatre compositions du présent disque, mais aussi deux quatuors à cordes inachevés, présentant seule­ment deux des quatre mouvements indubitablement prévus. Deux Romances publiées posthumément, l’une pour violon et piano, l’autre pour violoncelle et piano, remontent également à cette époque (celle pour violoncelle est datée du 6 août 1890). Quel dommage que Rachmaninov n’ait achevé aucun des deux quatuors à cordes, ni composé de grande œuvre de chambre, plus tard dans sa vie. Et quel rare chef-d’œuvre—une sonate pour violon, par exemple—aurait pu naître de son amitié avec Fritz Kreisler, dans les années 1920. Mais les pièces de chambre achevées par Rachmaninov dans sa jeunesse constituent déjà un corpus fascinant. Bien que composées entre 1891 et décembre 1893 (avant les vingt et un ans de Rachmaninov, donc), elles s’avèrent toute rach­maninoviennes et dépourvues d’immaturité—et de fait, un opéra en un acte, Aleko, la Fantaisie-tableaux (Suite no 1) pour deux pianos, la première version du Concerto pour piano en fa dièse mineur, op.1, et d’autres pièces, notamment le Prélude en ut dièse mineur, avaient déjà vu le jour. Une fois la partition du Concerto pour piano terminée, le 6 juillet (dans l’ancien calendrier slave) 1891, au domaine fami­lial d’Ivanovka, Rachmaninov acheva, en quelques semaines, une mélodie intitulée Matin (l’une des six mélodies, op.4) et un Prélude en fa majeur pour piano solo (20 juillet). Ce fut probablement alors qu’il rencontra le célèbre violoncelliste russe Anatoli Brandoukov, son aîné de presque dix-sept ans et dédicataire du Pezzo capriccioso pour violoncelle et orchestre de Tchaïkovski. Brandoukov et Rachmaninov semblent avoir été, musicalement du moins, des âmes sœurs: le violoncel­liste participa à la création de toutes les œuvres de chambre avec violoncelle de Rachmaninov, qui lui dédia deux de ses œuvres pour violoncelle et piano—les deux pièces, op.2 et la Sonate pour violoncelle, op.19. Les pièces, op.2 de Rachmaninov pour violoncelle et piano, qui furent parmi les premières œuvres du compositeur pub­liées par Gutheil, proposent une nouvelle version du Prélude pour piano en fa majeur susmentionné et une Danse orientale. Conservant fa majeur pour tonalité, le Prélude s’ouvre d’emblée sur l’exposition du thème principal au violoncelle, avec un accompagnement pianistique en accords. Puis une ré­exposition, légèrement plus élaborée, aboutit à une section plus rapide, où le piano gagne en importance, même si les deux instruments sont pleinement utilisés. Une reprise for­tement variée du thème d’ouverture, avec un piano plus affirmatif—quoique toujours accompagnant—, conduit le Prélude à une paisible conclu­sion. La Danse orientale en la mineur, de construction plus fluide, voit son caractéristique thème d’ouverture soumis à divers changements, mais reve­nant toujours à la mineur. La tranquille conclusion en pizzicato est, elle aussi, typique. À l’époque des deux «Morceaux de salon» pour violon et piano, op.6 (i.e. durant l’été de 1893), la réputation de com­positeur-pianiste de Rachmaninov était déjà plus fermement établie. Les pièces pour piano de l’op.3 (dont le Prélude en ut dièse mineur), mais aussi les mélodies de l’op.4, avaient été publiées, ou étaient sur le point de l’être, et la Fantaisie-tableaux pour deux pianos était achevée. Les pièces de l’op.6, une Romance et une Danse hongroise, possèdent une enver­gure et un plan identiques à ceux des pièces pour violoncelle, op.2. Une source affirme qu’elles furent dédiées au violoniste et compositeur Julius Conus, mais aucun détail ne subsiste quant à leur création. Les pièces de l’op.6 partagent une même tonalité (ré mineur), et la Romance, relativement étendue, s’ouvre d’em­blée sur le thème principal au violon, entendu contre un accompagnement fluide. Une contre-exposition de dévelop­pement de ce thème voit le violon essentiellement en octaves, cependant que l’écriture pianistique est plus entière et davan­tage dramatique. Ce qui aboutit à une reprise assez simple; puis une brève, mais efficace, cadenza dévolue au violon annonce les quatre mesures conclusives, enracinées dans ré mineur. Marquée «Vivace», la Danse hongroise est une pièce brillante, toute rachmaninovienne (surtout dans la figure accompagnante, au clavier), qui, à un moment, semble ren­voyer une idée du thème principal de la Romance. La maîtrise de l’écriture violonistique de Rach­ma­ninov est telle (même s’il a pu recourir à l’aide de Conus) que l’on regrette qu’il n’ait pas laissé d’œuvre pour violon plus imposante. Le 30 septembre 1893, le professeur de piano de Rach­maninov, Nikolaï Zverev, mourut à l’âge de soixante et un ans. De nombreux musiciens, dont Tchaïkovski, assistèrent à ses funérailles, à l’occasion desquelles Rachmaninov renoua avec le fameux compositeur. Un jour ou deux plus tard, chez Taneïev, Rachmaninov montra la partition de sa Fantaisie-tableaux à Tchaïkovski, qui l’autorisa à la lui dédier. Tchaïkovski avait beau­coup contribué à faire jouer Aleko au Bolchoï—fort du succès remporté, Rachmaninov avait alors été invité à diriger une nouvelle production, à Kiev, en octobre, et n’avait pu assister à la première de la Symphonie Pathétique de Tchaï­kovski, donnée sous la baguette du compositeur, le 16 octobre, à Saint-Pétersbourg. Après avoir dirigé les deux premières exécutions d’Aleko (et fait ses débuts de chef d’orchestre opératique), Rachmaninov rentra à Moscou pour préparer la création imminente, en novembre, de la Fantaisie-tableaux. L’annulation de son séjour à Saint-Pétersbourg fut, en un certain sens, une chance, car une épidémie de choléra s’y était déclarée—bien que quelque doute demeure quant à la nature exacte de la maladie qui emporta subitement Tchaïkovski le 25 octobre, l’on a longtemps pensé qu’il avait, chose incom­préhensible, bu de l’eau non bouillie pendant l’épidémie et contracté la maladie. Cette nouvelle choqua et peina Rachmaninov aussi vive­ment que l’ensemble du monde musical. Le soir de la mort de Tchaïkovski, il commença un second Trio élégiaque à la mémoire du maître. Difficile de rester de marbre face à cette œuvre, terminée le 15 décembre. Certes, la partie de piano, fleurie et difficultueuse (vers la fin du premier mouvement, elle explose en une quasi-cadenza), est manifestement bien plus importante que les parties des instruments à cordes, et d’aucuns pourront trouver le finale trop court pour contre­balancer les vastes dimensions des deux premiers mouve­ments, mais que cette œuvre recèle de passion et d’authen­tique profondeur de sentiment! Dédié «À la mémoire d’un grand artiste», l’op.9 est un mémorial digne du Trio avec piano en la mineur, op.50 que Tchaïkovski avait dédié à Nikolaï Rubinstein, en 1881. Ces trios commémoratifs recèlent des liens plus profonds: structurellement, l’œuvre de Rachmaninov se fonde fortement sur celle de Tchaïkovski, au point de comporter un corpus de variations en guise de second mouvement—et la parenté thématique des deux thèmes de variation sous-entend que Rachmaninov fit reposer le sien sur celui de Tchaïkovski. Le premier mouvement du Trio élégiaque en ré mineur de Rachmaninov semble, dans une certaine mesure, structurel­lement calqué sur son œuvre antérieure, en sol mineur, mais avec un degré d’accomplissement supérieur. Ainsi pouvons-nous discerner une grossière structure de sonate, mais ici, le matériau est davantage homogène, et la manière dont la lamentation introductive est reprise et prolongée (pour aboutir à une profusion de matériau semblant être une succession de variations étroitement interdépendantes), ajoutée à la façon stricte dont l’ensemble est ré-exposé—et aux subtiles relations tonales du mouvement—, révèle que cette musique était alors la plus formidable production à grande échelle de Rachmaninov. Comme nous l’avons vu, la variation constitue la base du second mouvement et le piano revêt, ici, peut-être plus d’impor­tance que dans le premier mouvement, puisqu’il annonce, seul, le long thème fondateur des «quasi-variations» et présente une longue variation solo (la seconde). Cependant, les huit varia­tions (qui ne furent pas ainsi dénombrées par le compositeur) sont approfondies et fort diverses, même si les cordes présentent une écriture visant à bien les placer dans le fond musical. Le finale, très bref, est structurellement simple. Une fois encore, le piano prédomine, qui débute sur une idée puissamment tchaïkovskienne, dominant la première moitié du mouvement. Passé un apogée, la lamentation initiale du premier mouvement est insinuée avant de reparaître, enfin, dans son intégralité, sa phrase chromatiquement descendante bouclant la boucle du Trio élégiaque. La fin de l’œuvre se confine au violoncelle et au piano. Le violon est absent. Dans la version originale du Trio, Rachmaninov requérait un harmonium dans le second mouvement. Mais l’écriture dévolue à cet instrument est telle qu’il est presque impossible au pianiste de jouer et l’harmonium et le piano. Cette version originale est donc l’unique exemple de trio avec piano requé­rant quatre instruments, et quatre instrumentistes! En 1907, Rachmaninov profita de la publication d’une édition révisée sans harmonium pour procéder à plusieurs changements, notamment dans le second mouvement, où une nouvelle variation vint remplacer une variation pour piano solo. Pour une autre exécution, en 1917, Rachmaninov fit plusieurs autres changements importants, ôtant surtout quelques mesures afin de resserrer la structure. La version originale du Trio élégiaque fut créée à Moscou, le 31 janvier 1894, lors d’un programme entièrement consacré à Rachmaninov (qui l’interpréta en personne, aux côtés de Brandoukov et de Julius Conus), où figuraient également les pièces pour violoncelle et piano de l’op.2, les pièces de l’op.6 (peut-être créées à cette occasion). Rachmaninov donna l’inté­grale de son op.3 et ses récents Morceaux de salon, op.10, ainsi que quelques mélodies (probablement extraites des opp.4 et 8). Le flambeau avait été passé à la jeune génération. Mit Ausnahme der Cellosonate in g-Moll, die 1901 im Anschluß an die zweite Suite für zwei Klaviere und das zweite Klavierkonzert entstand, entstammt Rachmaninows Kammermusik samt und sonders dem frühesten Abschnitt seiner Laufbahn. Diese Werkgruppe umfaßt die vier Kompositionen auf der vorliegenden CD sowie zwei un­vollendete Streichquartette mit jeweils nur zwei Sätzen eines zweifellos viersätzigen Gesamtplans. Dann sind da noch zwei Romances, eine für Geige und Klavier, die andere für Cello und Klavier, die postum veröffentlicht wurden und etwa aus der gleichen Zeit stammen (die Cello-Romanze trägt das Datum 6. August 1890). Es ist schade, daß Rachmaninow keines der beiden Streichquartette fertiggestellt und im späteren Leben kein bedeutendes Kammermusikwerk mehr geschrieben hat. Hätte seine Freundschaft mit Fritz Kreisler in den 20er Jahren beispielsweise eine Violinsonate hervorgebracht, wäre uns womöglich ein weiteres rares Meisterwerk von ihm erhalten. Wie dem auch sei: Die frühen abgeschlossenen Kammer­musikwerke Rachmaninows bilden eine faszinierende Gruppe. Sie entstanden in den zwei Jahren bis Dezember 1893. Somit lag diese Musik fertig vor, ehe er einundzwanzig Jahre alt war, und ist doch ganz und gar typisch und keineswegs unreif—bis dahin hatte Rachmaninow bereits die einaktige Oper Aleko, die erste Suite der Fantaisie-tableaux für zwei Klaviere und die erste Fassung seines Klavierkonzerts in fis-Moll op. 1 kom­poniert sowie mehrere andere Stücke, darunter insbesondere das Prélude in cis-Moll. Die Partitur des Klavierkonzerts ist auf den 6. Juli (des alten julianischen Kalenders) 1891 datiert; nachdem es auf dem Familiengut Iwanowka fertiggestellt worden war, kamen in den folgenden Wochen das Lied Morgen (eines von sechs als op. 4 veröffentlichten Liedern) und ein am 20. Juli vollendetes Prélude in F-Dur für Klavier allein hinzu. Um diese Zeit muß es gewesen sein, daß Rachmaninow den bekannten russischen Cellisten Anatoly Brandukow kennenlernte, der fast siebzehn Jahre älter war als er und Widmungsträger von Tschaikowskys Pezzo capriccioso für Cello und Orchester. Zumindest musika­lisch scheinen sich Brandukow und Rachmaninow bestens verstanden zu haben, denn der Komponist widmete dem Cellisten seine beiden publizierten Werke für Cello und Klavier—die Zwei Stücke op. 2 und die Cellosonate op. 19—und er war an den Uraufführungen sämtlicher Kammermusik­werke Rachmaninows beteiligt, die ein Cello verlangen. Rachmaninows Stücke für Cello und Klavier op. 2, die zu seinen frühesten bei Gutheil veröffentlichten Werken gehören, sind eine Neufassung des oben erwähnten Prélude für Klavier in F-Dur und ein Danse orientale. Das Prélude behält F-Dur als Tonart bei und setzt mit der Darlegung des Hauptthemas durch das Cello über akkordischer Klavierbegleitung ein. Es folgt eine nochmalige, etwas weiter ausgeführte Darlegung, die zu einem schnelleren Abschnitt überleitet, in dem das Klavier größere Bedeutung gewinnt, obwohl das Potential beider Instrumente voll ausgenutzt wird. Eine stark variierte Reprise des ein­leitenden Themas, in der das Klavier stärker in den Vordergrund rückt, obwohl es immer noch begleitende Funktion hat, bringt das Prélude zu einem ruhigen Abschluß. Der folgende Danse orientale in a-Moll ist flüssiger gestaltet, mit einem charak­teristischen ersten Thema, das sich im Laufe seiner Durch­führung mehrfach verändert, aber immer nach a-Moll zurück­kehrt. Der ruhige Pizzikatoschluß ist für Rachmaninow typisch. Um die Zeit der zwei „Morceaux de salon“ op. 6 für Geige und Klavier—also im Sommer 1893—war Rachmaninow als Komponist und Pianist bereits besser etabliert. Seine Klavier­stücke op. 3 (darunter das Prélude in cis-Moll) sowie die Lieder op. 4 waren erschienen oder standen kurz vor der Veröffentlichung, und er hatte die Fantaisie-tableaux für zwei Klaviere fertiggestellt. Die Stücke op. 6—eine Romance und eine Danse hongroise—ähneln von der Anlage und vom Umfang her den Cellostücken op. 2. Wahrscheinlich waren sie dem Geiger und Komponisten Julius Conus gewidmet, wie eine Quelle behauptet, aber über die Uraufführung sind keine Einzelheiten bekannt. Die Stücke op. 6 stehen beide in der gleichen Tonart (d-Moll), und die relativ umfangreiche Romance beginnt mit dem Hauptthema auf der Geige vor fließender Begleitung. In der durchführenden Entgegnung des Themas hat die Geige vor­wiegend Oktaven zu spielen, und auch die Klavierführung ist ausgefüllter und dramatischer. Es folgt eine relativ geradlinige Reprise, ehe eine kurze, aber effektvolle Kadenz der Geige zu den in d-Moll verwurzelten letzten vier Takten überleitet. Der „Vivace“ überschriebene Danse hongroise ist ein brillantes Stück, ausgesprochen typisch für Rachmaninow (insbesondere in der begleitenden Klavierfigur), in dem an einer Stelle eine Idee aus dem Hauptthema der Romance widerzuhallen scheint. Der Komponist beherrscht die Violinführung so meisterhaft (auch wenn er in dieser Hinsicht Conus’ Hilfe in Anspruch genommen haben könnte), daß es bedauerlich ist, daß er kein ausführlicheres Werk für das Instrument hinterlassen hat. Am 30. September 1893 starb Rachmaninows Klavier­lehrer Nikolai Zwerew im Alter von einundsechzig Jahren. Viele Musiker wohnten der Trauerfeier bei, darunter auch Tschai­kowsky, und bei diesem Anlaß erneuerte Rachmaninow seine Bekanntschaft mit dem berühmten Komponisten. Ein, zwei Tage darauf zeigte Rachmaninow bei Tanejew daheim Tschai­kowsky die Partitur seiner Fantaisie-tableaux und erhielt die Erlaubnis, ihm das Werk zu widmen. Tschaikowsky war ein wichtiger Ver­bündeter gewesen, als es darum ging, Rachmaninows Oper Aleko am Bolschoi-Theater zur Auffüh­rung zu bringen, und der damalige Erfolg des Werks führte dazu, daß Rachmaninow eingeladen wurde, im Oktober eine Neuinszenierung in Kiew zu dirigieren. Darum versäumte Rachmaninow die Uraufführung von Tschaikowskys Sinfonie Pathétique unter der Leitung des Komponisten am 16. Oktober in St. Petersburg. Rachmaninow leitete die ersten beiden Aufführungen von Aleko (sein Debüt als Operndirigent) und kehrte dann nach Moskau zurück, um die im November bevor­stehende Uraufführung der Fantaisie-tableaux vorzubereiten. In gewisser Hinsicht war es ein Glück, daß Rachmaninow nicht nach St. Petersburg reisen konnte, denn dort war eine Cholera-Epidemie ausgebrochen. Auch wenn die genaue Natur von Tschaikowskys letztem Leiden in Zweifel steht, geht man seit langem davon aus, daß er un­verständlicherweise unabgekochtes Wasser trank, während die Seuche wütete, und sich die Krankheit zuzog. Er starb plötzlich am 25. Oktober. Rachmaninow war wie die gesamte Musikwelt von dieser Nachricht zutiefst betroffen und erschüttert. Am Abend von Tschaikowskys Todestag begann er im Gedenken an den Meister ein zweites Trio élégiaque, das er am 15. Dezember fertigstellte. Man kommt kaum umhin, von diesem Werk beeindruckt zu sein. Es stimmt, daß der Klavierpart hoch figuriert und ausgesprochen schwer zu spielen ist (an einem Punkt gegen Ende des ersten Satzes bricht er in eine Art Kadenz aus), und er ist eindeutig viel wichtiger als die Streicherstimmen. Das Finale ist möglicherweise zu kurz, um die größer dimensionierten ersten zwei Sätze aufzuwiegen—aber wieviel Leidenschaft und echte Gefühlstiefe sind in diesem Werk enthalten! Rachmaninows op. 9, der „Erinnerung an einen großen Künstler“ gewidmet, ist ein ebenso würdiges Denkmal für Tschaikowsky, wie es Tschaikowskys a-Moll-Klaviertrio op. 50 im Jahre 1881 für Nikolai Rubinstein war. Die Verbindungen zwischen den beiden Gedenktrios gehen jedoch tiefer; strukturell beruht Rachmaninows Komposition in erheb­lichem Maße auf der von Tschaikowsky—das geht soweit, daß beide als zweiten Satz eine Variationsfolge aufweisen, und die thematische Ähnlichkeit der Variationsthemen deutet darauf hin, daß Rachmaninow seines aus dem von Tschaikowsky abgeleitet hat. Der erste Satz von Rachmaninows Trio élégiaque in d-Moll ist, so scheint es, strukturell in gewisser Hinsicht an das ältere Werk in g-Moll angelehnt, auch wenn es gekonnter aufgebaut ist. So ist eine Sonatenform in groben Umrissen zu erkennen, doch das Material ist hier homogener. Die Art, wie das einleitende Lamento wiederaufgenommen und erweitert wird, sodaß sich eine Fülle von Material in Form einer Folge eng verwandter Variationen ergibt, und die strenge Gestaltung der Reprise belegen—neben den subtilen tonalen Beziehungen innerhalb des Satzes—, daß dies Rachmaninows bis dahin bedeutendste großangelegte Komposition ist. Wie schon gesagt ist der zweite Satz in Variationsform gehalten, und das Klavier erlangt hier wohl noch größere Bedeutung als im ersten Satz. Das Klavier allein verkündet das lange Thema, auf dem die Quasivariationen basieren, und ihm fällt auch eine lange Solovariation zu (die zweite). Dennoch sind die acht (vom Komponisten nicht durchnumerierten) Variationen sowohl ausführlich als auch recht weit gespannt, obwohl die Streicherführung so geartet ist, daß diese Instrumente musikalisch in den Hintergrund treten. Das Finale ist recht kurz und einfach aufgebaut. Wiederum dominiert das Klavier und beginnt mit einer stark an Tschai­kowsky gemahnenden Idee, die die erste Hälfte des Satzes beherrscht. Sie baut zu einem Höhepunkt auf, nach dem das einleitende Lamento des ersten Satzes angedeutet wird, ehe es in ganzer Länge wieder auftritt und seine chromatisch absteigende Phrase den Kreis des Trio élégiaque schließt. Der Schluß des Werks ist auf Cello und Klavier beschränkt. Die Geige schweigt. In der ursprünglichen Fassung des Trios verlangte Rach­maninow im zweiten Satz ein Harmonium. Dessen Stimme ist so geführt, daß es dem Pianisten so gut wie unmöglich ist, sowohl Klavier als auch Harmonium zu spielen. Diese Originalfassung ist darum wohl das einzige Klaviertrio, für das vier Instrumente und vier Ausführende nötig sind! 1907 gab Rachmaninow eine überarbeitete Fassung heraus, in der nicht nur auf das Harmonium verzichtet wird, sondern auch noch weitere Änderungen vorkommen; die wichtigste ist eine neue Variation im zweiten Satz, die eine gestrichene Variation für Soloklavier ersetzt. Für eine Aufführung im Jahre 1917 nahm Rachmaninow weitere bedeutende Änderungen vor—indem er vor allem zur Straffung des Aufbaus eine ganze Reihe von Takten strich. Die Originalfassung des Trio élégiaque wurde am 31. Januar 1894 in Moskau uraufgeführt, im Rahmen eines aus­schließlich mit Werken Rachmaninows gestalteten und vom Komponisten, Brandukow und Conus gespielten Konzerts. Damals wurden außerdem die Stücke für Cello und Klavier op. 2 und die Stücke op. 6 (möglicherweise als öffentliche Erstaufführung) gegeben; Rachmaninow spielte sein op. 3 vollständig, die neuen Morceaux de salon op. 10 sowie Lieder (vermutlich aus op. 4 und 8). Die Fackel war an eine jüngere Generation weitergereicht worden.